Madras 375 – Not out!!! I’m not a Madras boy. Not born there. Didn’t quite spend my formative childhood years there. Have not worked for long in that city as well. But have been frequenting Madras as a visitor since the late 80’s enough to suffer from “Madrasitis” 🙂 Ergo, as Madras, the oldest city the British built in India celebrated its 375th birthday last week I couldn’t help recount the different vignettes imprinted in me around Madras. I am aware that at best that can only be an inside view of an outsider, nonetheless an honest one I promise. I have very foggy memories of the first 4-5 years I spent as a child in the 70’s. So, nothing much really to recall except that we were staying few minutes away from Luz corner at Mylapore which is today stereotyped as the cultural nerve centre of Chennai. So my account is all from the 2 years I spent in Madras when I worked in the 90’s and the few days I spend on and off every year mostly on business and at times otherwise. Conservatism was at the heart of Madras. Keeping a low profile, being simple, not showing off and to some extent being subservient were drilled into as essential behavioural requirements for children. This drill over a period of time got into the genes and brought up Madras as a quintessential traditional society. A talented A.R.Rahman or a Superstar Rajinikant or a brilliant Maniratnam all products of this Madras would always be grounded even while flying high in their respective careers. This conservatism had its share of problems as well. Bachelors would find it difficult to get accommodation. Survival in Madras for outsiders if you didn’t know the language was a nightmare. The opening up of the stock market in the 90’s and later the IT boom slowly brought what is today a cosmopolitan cut to the once traditional Madras. But there were other good things which didn’t have to wait for long. The beaches for one. The Edward Elliot’s beach in Madras just few kilometres away from the more famed Marina beach was not as popular but had a quaint appeal to it. With not many shops or eateries as it is today, the beach was clean and was a jogger’s delight. The sea with its characteristic rough and not so rough demeanour was inviting to even a diehard hydrophobic. As a child, standing in the water and getting lashed by the waves was an exciting pastime. Little one realized then that it would be the same even when you grew up. The mobile Aavin Van booth at the beach served the best fresh flavoured milk in town then. The Marina beach ahead had a different flavor. More crowded, more eateries, more noise and more love birds hiding behind boats and under fishing nets only to be discovered by young boys selling ‘Manga Thenga Pattani Sundal’ a unique recipe of Sundal (Peas) generally sold only in the beach. As the evening fades and the dark sets in, the rotating light from the lighthouse gives you the signal to start packing off – and you do so reluctantly only to come again another day. Moving away from beaches, the next thing which rings in your ear when you think of Madras is its moorings with classical music. Come December and the “Season” arrives with its characteristic charm. 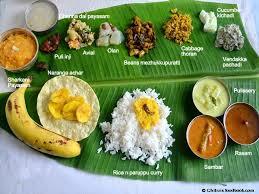 For the uninitiated the “Season” here alludes to the ‘Carnatic Music’ season. By the way Madras or today’s Chennai has 3 seasons. – Summer, Hot Summer and Music Season 🙂 🙂 So during this music season Carnatic musicians of all hue descend into the city and spread across 3 weeks play/sing “notes” of their lives in an attempt to get noticed. So much so even if you are a top notch Carnatic musician with acclaim elsewhere, you are a nobody until you have performed in this capital during the “Season” that too in the evening slots. Aspiring musicians pay money to sabhas to earn a slot in the mornings/afternoons just to be a part of the “Season”, I am told. Apart from performances, old mamas mostly and sometimes accompanied by mamis saunter across in the early mornings with mufflers and shawls (the only time in the year when you have to take these wear out in Madras 🙂 ) to different sabhas to understand the nuances of Kalyani Ragam and its variant Yaman Kalyani or other such purists’ lookouts in “lecture and demonstration” sessions. For lesser mortals there is always the difference between Sada bajji and Mulaga bajji to worry about 🙂 🙂 During the “Season” for many, the filter Kapi (coffee) at the canteen outside is as important as the ‘Kaapi’ raga rendition inside the auditorium. Just cannot afford to miss both. The filter Kapi brings us to the next attraction of Madras which is the food. The city is a vegetarian’s paradise. For all those who get carried away by the Idli/Dosa/Vada/ Sambhar dished out at the various so called south Indian joints all over the country, you haven’t tasted the real thing yet if you haven’t tried all these in Ratna Café or Saravana Bhavan or Sangeetha or that Murugan Idli Kadai in Madras. Today joints like Saravana Bhavan are in the forefront of transporting the “Madras culture” to various cities across the globe where our bright IT Engineers are writing codes to glory. Any talk of “Madras culture” is incomplete without reference to Mylapore located at the heart of the city. Time permitting, I don’t miss a visit to Mylapore when in Chennai even today. The long walks to Kapaleeswarar temple via Luz from my house, the compulsory visit to Giri Traders to catch up with latest on classical music, the mandatory check at the Ambika Appalam store for any new item ( 🙂 ), Coffee at Saravana Bhavan and the walk along Nageswara Rao Park smelling the Amrutanjan in the air and shopping at Rex Fashions are things which are etched well in my memory. As I jog my memory further the other thing I enjoyed in the 2 years I stayed in Madras was catching up with Tamil plays in the weekends. The Mylapore Fine Arts was at walking distance and was popular with all the leading troupes of the day like Crazy Mohan, S.V.Shekhar, Y.G. Mahendran, Poornam Viswanathan,… I am talking of a time when there were still takers for Drama. Essay on Madras and no reference to the notorious autowallas??? I am told that “Amma” has been successful in implementing electronic meters in auto rickshaws this year and I hope the system is working. For years, one had to put up with the tyranny of autowallas in Madras. Those days when the train reached Basin Bridge, I used to brace myself for the fight with the autowalla at Madras Central Station. The autowallas knew to outsmart the passengers every time and ask for more. “Konjam Meterukku mela pottu kudunga, Sir” (Sir please pay more than the meter) used to be one jarring line one hated to hear. And the reasons for asking more than the meter were ingenious. “Sir the destination is very far, Sir the distance is too short, Sir I will have to return empty, Sir you have 3 luggage pieces, Sir there the road is not good, Sir it is raining, Sir there is no light in that area and too dark, Sir the meter is not working, Sir prices have gone up, Sir Naan Pulla Kutti Kaaran (I have children),….!! !” 🙂 🙂 Invariably we were asked to fork out for the ills of everybody else!!! The advent of Call taxis and now the E-meters hopefully have put an end to this Autowalla tyranny. 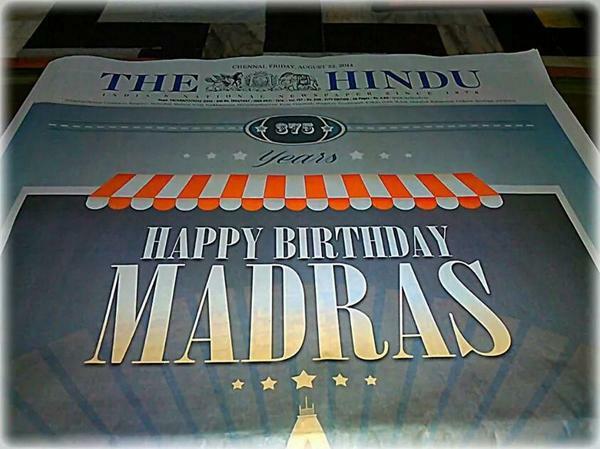 I can keep writing on many other aspects of “Madrasitis” like the annual test match at Chepauk during Pongal, the influence of Kodambakkam aka films on people, the day long shopping by women for Silk Sarees at Mambalam, Woodlands Drive-in – the Salespeople’s’ adda, the poster culture eulogizing film stars then and politicians now (Witness “Amma” being elevated to a Durga one day Ganga/ Parvathi/Queen Mary/Radha/Kaali/Mother Teresa/,.. some other day in posters and cut-outs plastered all over the city) and so on. This post has gone too long. But then 375th Birthday for a city doesn’t come every other day. Wishing our very own Madras (I’m not a fan of this changing names of cities when a party comes to power) while being 375 Not out many more runs and a long,…. innings!!! James Bond comes out of British Airways at Chennai, goes to his waiting driver and says “I’m Bond, James Bond. James to you”. Stir up to Sell – The New Mantra(d)!!! I don’t recall many ads in the recent past which have kicked off such a huge debate as the new Airtel ad which went on air last week. If you are one to miss that, do watch it here. Twitterati is divided in the middle as to if the ad is reinforcing male/female stereotypes or breaking. Or for that matter if the ad is trying hard to be feminist when it is not and so on. As is the wont these days, when social media buzzes on something, can the main stream media be left far behind?? I must have pored into atleast 10 columns trashing or eulogizing the ad. This is one interesting debate on TV !!! While the ad breaks new ground in showing a successful woman who is giving stern work instructions to her male subordinate in the 1st half, in the second half, the same lady is shown as a better half cooking dinner for her husband who is incidentally the same subordinate at office. The common critical take in the social media is questioning this apparent stereotyping of women – as submissive where the lady inspite of being a successful career woman has to don the dutiful wife role at home and cook food. Coming on the heels of the now famous quote of Indra Nooyi that “Women can’t have it all” the response to this ad has been pretty predictable. Somehow the narrative of a successful career woman but cooking food for her partner at home has not been consumed well. In all this debate on the ad what is being missed according to me is the strategy behind the narrative of the ad itself. Which is, to take a contrarian position, stir up a storm and be top of the mind for a good few days there by get more bang for the buck spent. And this trend in advertising has not started with this Airtel ad. This goes back quite a few years. In the past marketers were more circumspect in adopting this “Stirring up a storm” strategy to sell their products. So you saw this once in a while like the Liril waterfall ad of yore or the ad for Tuff Shoes where the models Milind Soman and Madhu Sapre were wearing just a snake and so on,.. But oflate, I guess marketers and their advertising counterparts have become more belligerent in adopting this strategy to hawk their wares and get their space under the Sun. So we now get see more and more ads which go against established stereotypes. 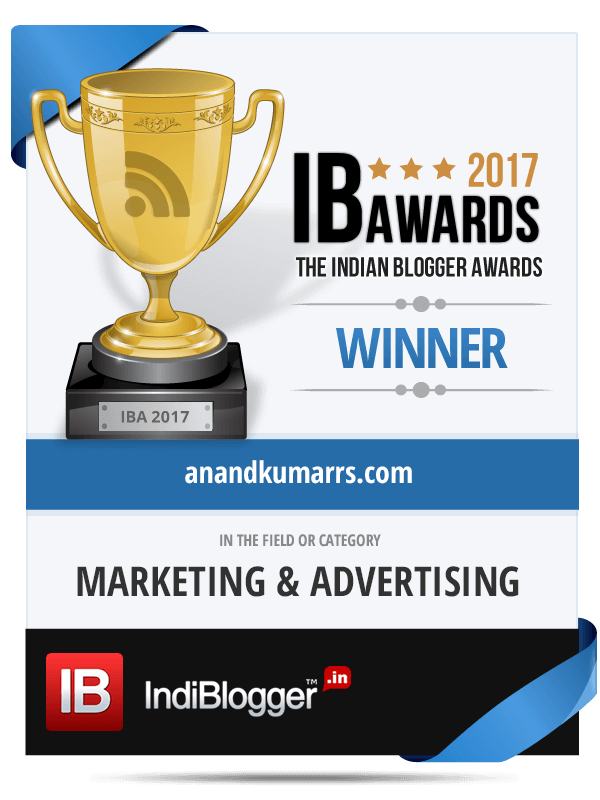 As per me, in Indian advertising Balki of Lowe and his team has been one who have used this quite effectively and often. The Havells ads for fans usually go against the grain. Same for some of the “What an Idea, Sirji” commercials for Idea Cellular. The Jaago Re campaign for Tata Tea also I would say fall in this category of ads. This recent ad for Brooke Bond Red label tea by Ogilvy India is another example of going against the tide to garner attention. The Hindu-Muslim plot (normally avoided in commercials) in the story is the new twist. There is always this threat of a strong over powering story shadowing the brand itself in ads. Like in this case while I remembered that it was a tea ad, had to drink few cups and wake myself up to recall the brand 😦 😦 This happens. Recently, the series of ads for Kaun Banega Crorepati (KBC) by Leo Burnett India have also been treading this path and have met with a lot of keen interest. The two spots I saw (see here and here) as part of the campaign shatter established stereotypes. Not that great ads are required to evince interest in a successful show like KBC with Amitabh Bachchan as the anchor. But I guess they also have to sustain the interest after so many seasons.